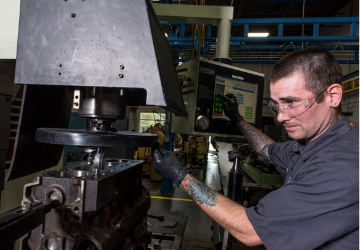 Each day at our Perkins engine remanufacturing facility in Ridgefield, Washington, our team of factory-trained technicians breathes new life into used engines. Parts are scrubbed clean, repairs are made to salvageable components and the engines are put back together. We are consistently recognized for our expertise in this process. We often emphasize the quality and savings customers get from opting for a remanufactured engine. But our remanufacturing program also has a huge impact that some people might not consider – the environment. By remanufacturing, we are able to positively impact the environment in numerous ways. Studies show that rebuilt engines need 50% less energy and only 67% of the labor required to produce new engines. The Fraunhofer Institute in Stuttgart, Germany, demonstrated the yearly energy savings by remanufacturing worldwide equals the electricity generated by five nuclear power plants or 10.7 million barrels of crude oil, that’s an equivalent to a fleet of 233 oil tankers. The yearly raw materials saved by remanufacturing worldwide would fill 155,000 railroad cars forming a train 11,100 miles long. The Automotive Parts Remanufacturers Association, an industry group dedicated to promoting remanufacturing processes, outlines several areas where its members’ practices benefit the environment. Our remanufacturing process reflects these outcomes. Unused and discarded engines are often melted down to be reused. But to do that, it takes intense heat. The smelting process consumes millions of barrels of oil or other forms of energy. Remanufacturing engines helps reduce the input to resmelting. A remanufactured engine typically takes 1½ engines to produce. This recycling of parts gives at least a second life to the components and reduces the need for raw materials like iron, aluminum and copper necessary to build new parts. 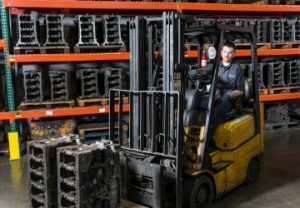 Our remanufactured engines also keep millions of tons of iron, aluminum and copper from landfills, thereby saving space and money. Resmelting releases pollutants into the air. Once again, keeping parts out of the resmelting process benefits the environment by reducing the air pollution that is generated by resmelting. The remanufacturing process is actually one component of a larger recycling and energy conservation effort at our company. We’ve upgraded lighting at our site to high-efficiency fluorescents and LEDs that save energy and provide a safer work environment. We are continually evaluating our waste streams to develop processes that let us improve upon our best practices standard. This evaluation includes identifying the safest detergents and solutions we use in the wash process of remanufacturing. Saving customers money and giving them a quality engine is satisfying, but doing it in a way that also helps the environment is an added benefit we are proud to provide.